The SATO CS-9018 is the ultimate finishing equipment for customers who need to slit, cut, and sequentially stack preprinted tags. 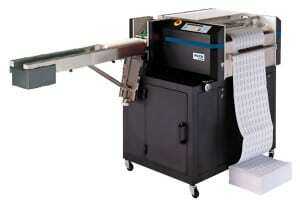 This easy to use cutter/stacker is capable of processing 188,000 tickets per hour. There’s a reason some of the world’s largest retailers and print shops use SATO’s LP 100R printer with the SATO CS-9018 cutter/stacker – speed, capabilities and low cost to use.